The United States Navy’s elite aerobatic team is celebrating a big anniversary. The Blue Angels are turning 70-years-old and are marking the occasion with a showcase performance! For seven decades now, the Navy’s high-performance, aeronautical demonstration team has wowed about half a billion people, which is actually the flashy squadron’s purpose… showcasing American courage, honor and commitment. 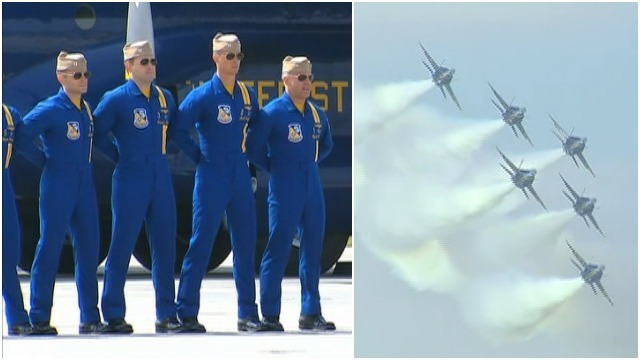 “As a team, I think it goes without saying, we’ve shown people it doesn’t matter if you’re in the military, it doesn’t matter if you’re in the Navy or the Blue Angels, but if you work together as a team to a common goal, you can accomplish almost anything,” said Blue Angels Lieutenant Ryan Chamberlain. On April 24, 1946, Chief of Naval Operations Admiral Chester W. Nimitz ordered the establishment of the team. The first air show was on June 15, 1946 in Jacksonville, Florida.